This weekend, Brent and I were sitting out on our porch talking about what foods we wanted to get for the week. After spending about a year with my parent’s, Brent picked up the love for Eggplant Parm. It’s become a running joke that it’s one of the only ways we can get him to willingly eat veggies. I haven’t really been eating pasta all too often and wasn’t really feeling the heaviness of it. It’s not on my summer food loving list. Immediately, the idea was born. Spaghetti squash Eggplant Parm. The recipe below is actually a combination of two that I have done before. 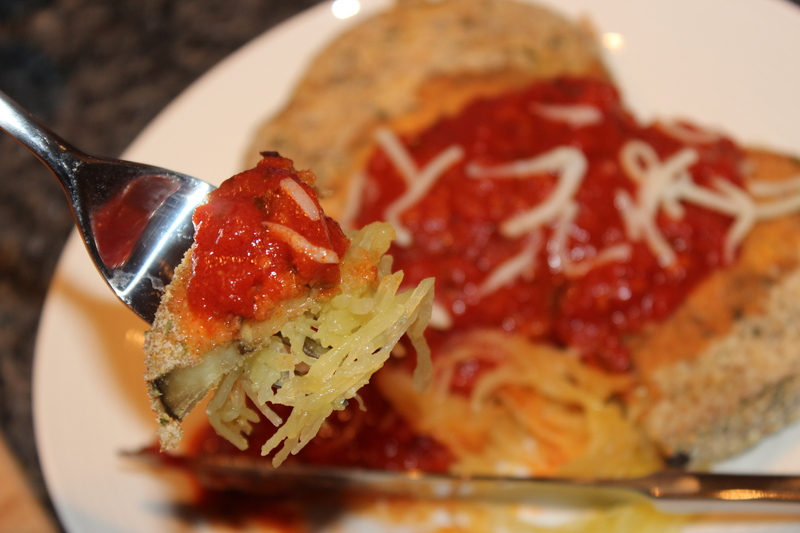 Baked Eggplant and just a typical Spaghetti Squash. 1. Preheat the oven to 400 degrees. 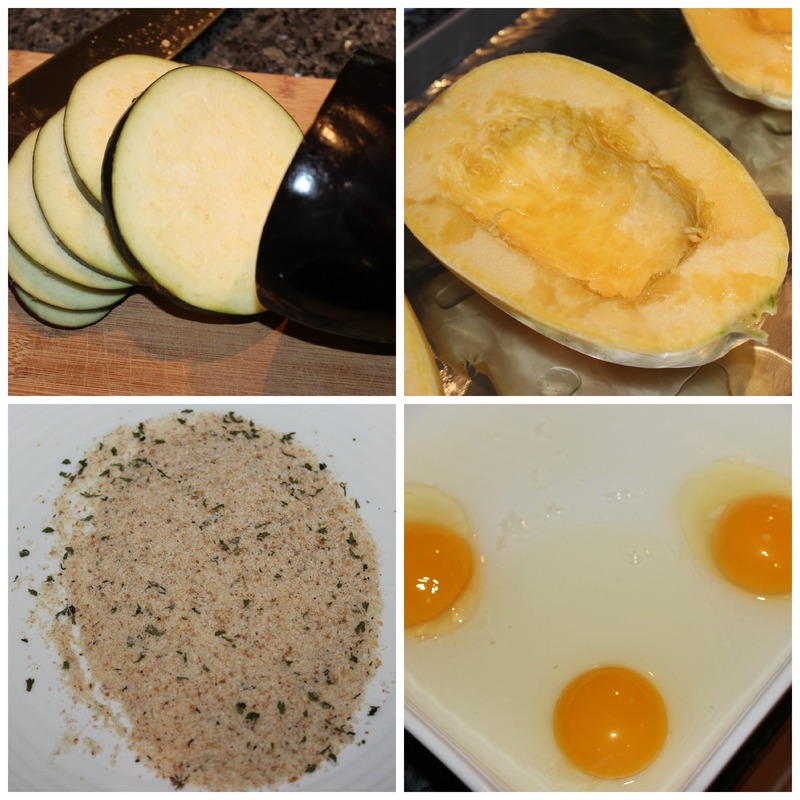 Cut each squash in half and remove the seeds. Spread the olive oil over the inside of half and place them face down on a baking sheet. Bake them for 40 minutes or until the outside has become soft or wrinkly. 2. Let them cool off to the side for a few minutes. Then take a fork to the inside of them and scrape the squash from the inside. It will turn into strings. Place the squash in a bowl. 1. 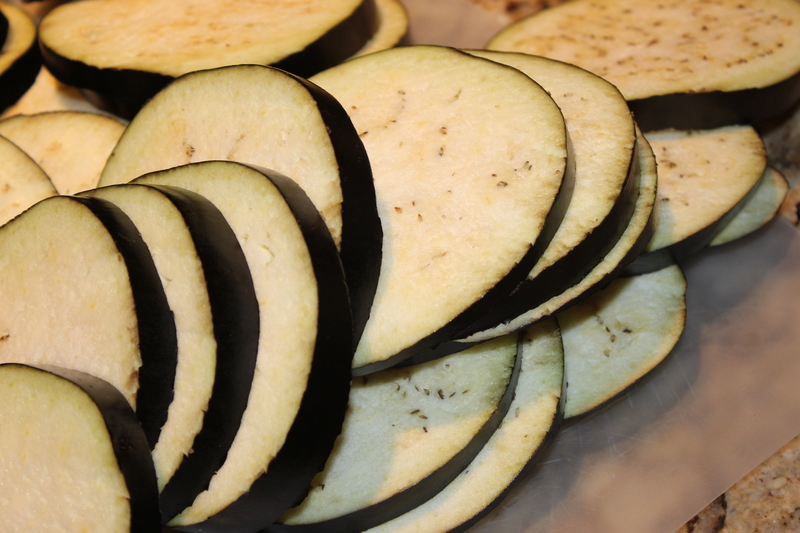 Slice the eggplant in even slices with 1/4 inch to 1/2 inch width, depending on your preference. It’s more important to make them even. 2. In a flat dish with edges, whip up the eggs with 1 tablespoon of water until it is uniform. Place the bread crumbs on a separate plate. 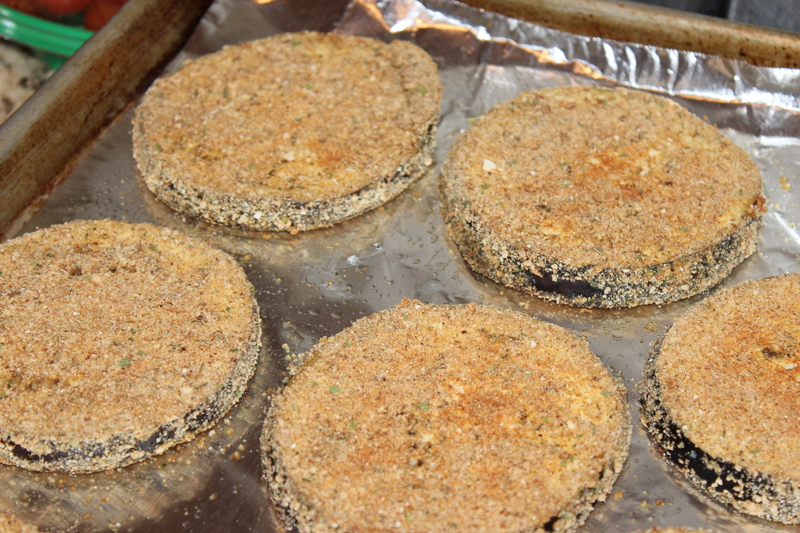 Take a slice of eggplant, place it in the eggs mixture until well covered, then transfer it to the bread crumb plate and cover it with the crumbs. Don’t forget to do the sides! 3. Put the eggplant slices on a baking sheet. Once all of the slices are finished, bake them for 15 minutes at 400 degrees, flip them over and bake for another 15 minutes or until as crispy as you want. 4. 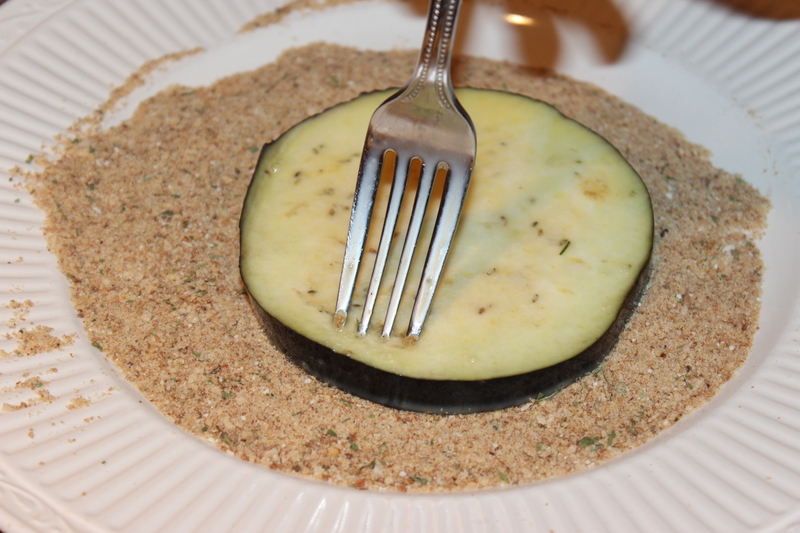 To serve, top the squash with the eggplant and finish with some red sauce and mozzarella. DONE! You can make the squash and the eggplant at the same time. So don’t wait for the squash to finish in the oven before starting the eggplant. Brent took a bite of it and I quote, “This may be the best thing I have ever eaten.” Words like this are really rare because normally I get, “Yea, it’s good.” And it’s a plate of veggies!! This will be making another appearance. I used a new red sauce for this as well, and it was delicious. 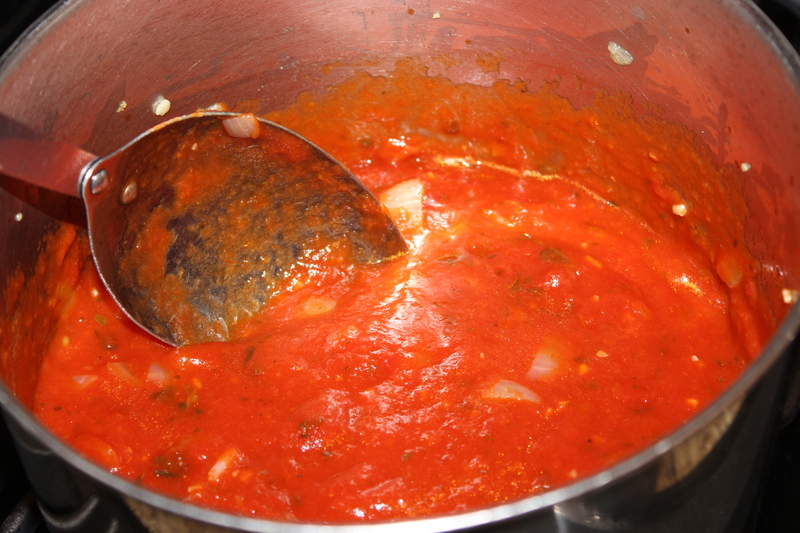 I would recommend you give it Rao’s Homemade Red Sauce a try. You could make this gluten free by just substituting gluten free bread crumbs. Have you ever changed a favorite and had it turn out better? 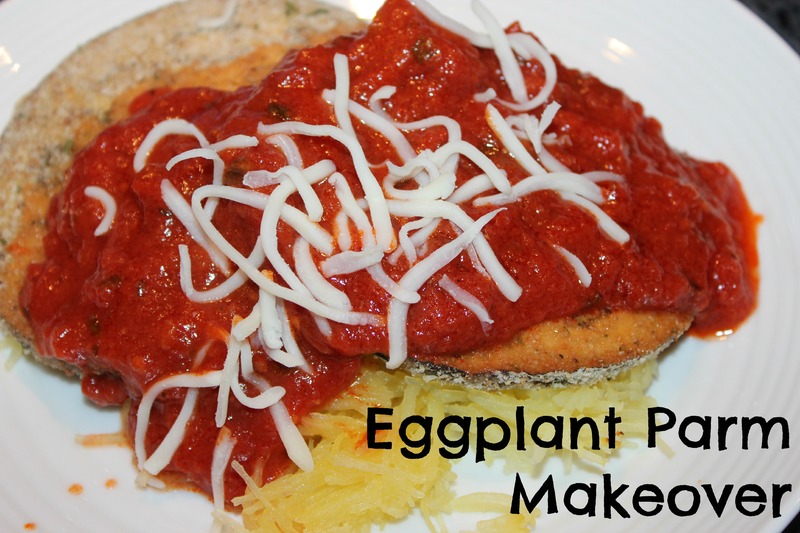 This entry was posted in Dinner, Gluten Free, Random, Vegetarian and tagged dinner, Easy, Eggplant, Eggplant Parm, Gluten Free, Healthy, Low Carbs, Mozzarella Cheese, Parm, Parmesan, Spaghetti Squash on August 14, 2014 by Sizzle Food. 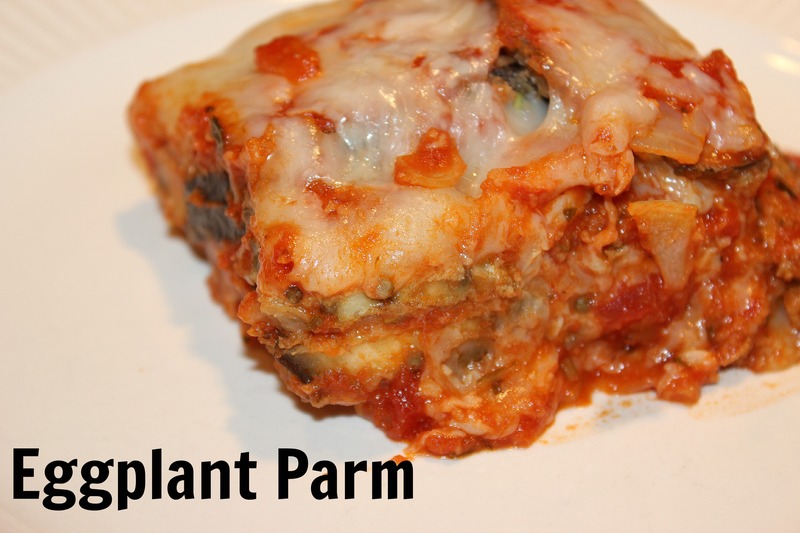 Eggplant Parm, Love it or Hate it? I have NEVER really been a fan of eggplant. The texture, the flavor…the everything about it. Well, the color is kind of pretty. But, I can’t really say I ever would have ordered eggplant anything throughout my entire life. But, I feel like the whole, your taste buds change while you grow up is completely true. I really like eggplant now. And onions, and tomatoes, and veggies in general. Brussels sprouts might just have to stay in limbo for right now. Fun fact: They say that the bitter flavor of brussels sprouts is really distasteful to children because when you are younger you have more taste buds. The bitter flavor typically indicates something that may contain toxins, where as sweets are generally safe to eat. So children will spit it out in response to the bitter flavor, where adults won’t be keying in on the bitter flavor and be able to enjoy them a bit more. Eggplant I think has always been a texture thing to me. 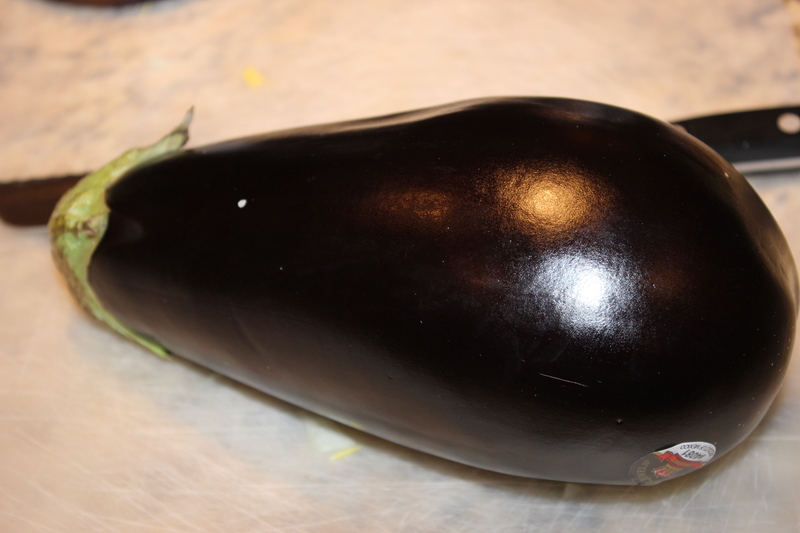 I’m finally getting used to the texture of a nice fresh eggplant and it is kind of growing on me. It is also my father’s favorite so I know this meal is going to be around for a long long time. My dad had been talking about eggplant parm for a while and when my mother was out of town for a few weeks, we decided to whip some up for him. 1. 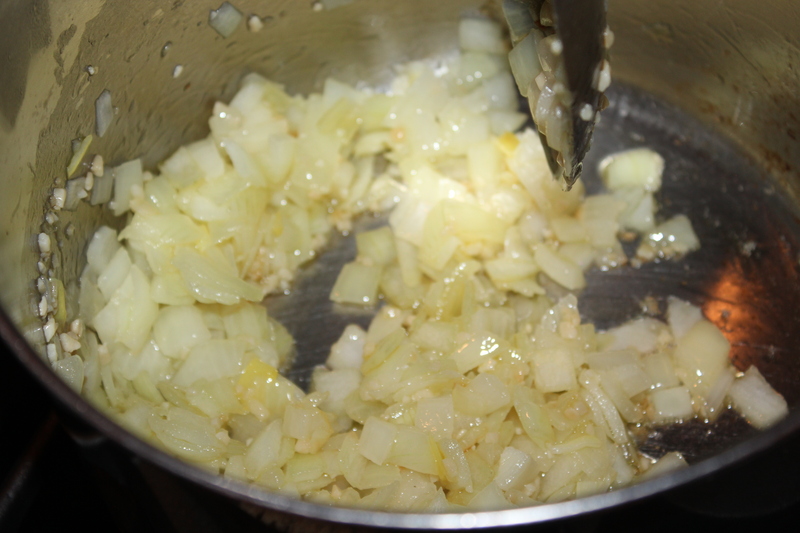 In a medium sized pan, add in a tablespoon of olive oil, minced garlic and your large onion, diced. I used a vidalia onion, but a yellow onion would work well too. Set it on a medium heat and stir frequently until the onions are cooked through. When the onions are cooked, add in the two jars of sauce. It can be any flavor you like. I used an italian sauce. 2. 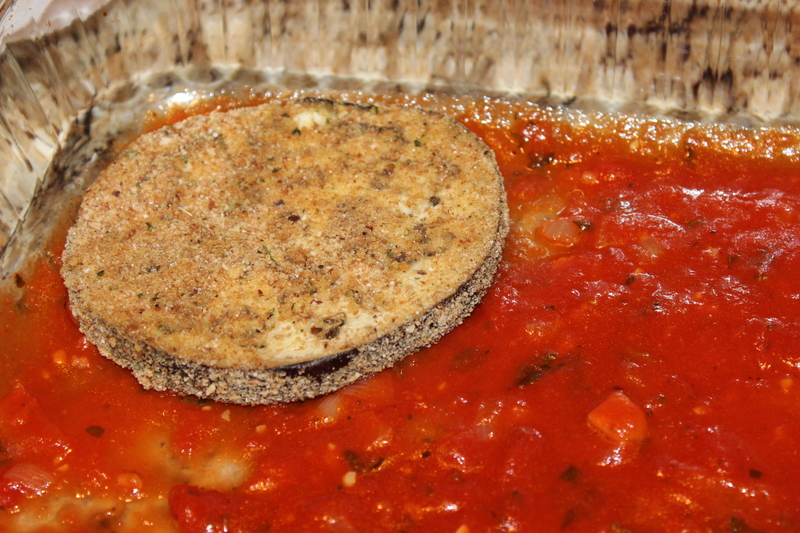 With the sauce sitting on simmer, take your eggplant and cut them into thicker slices. 3. 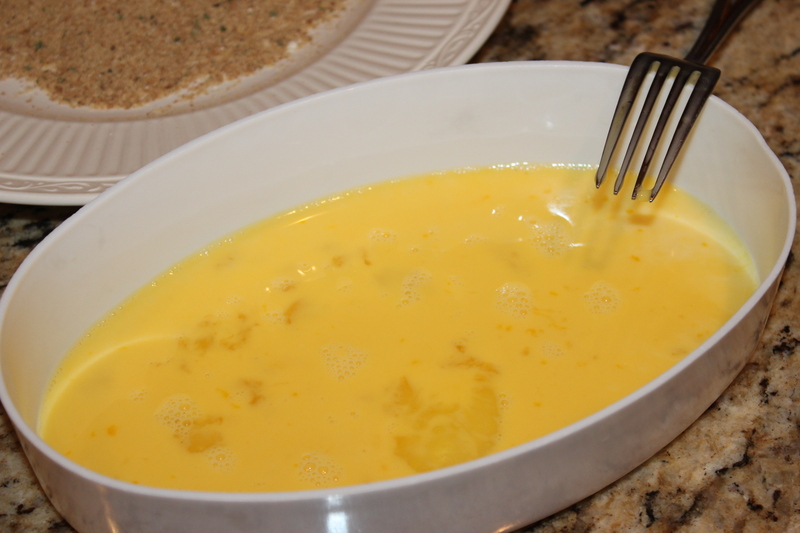 Next, in a flatter dish, whisk the eggs with your milk until they are well combined. 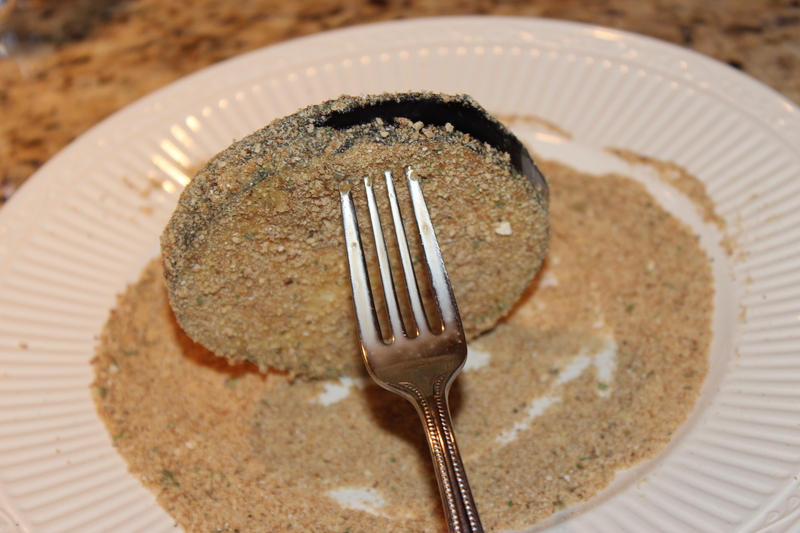 Then dip the eggplant slice into the egg, covering it on both sides and then dip it into your bread crumbs, covering it on both sides, as well as the edges. 4. Place the slices on a baking sheet lined with tin foil and bake them all at 350 degrees for about 10 minutes, or until the eggplant looks browned. Then, flip them over and give it another 5 minutes. 5. 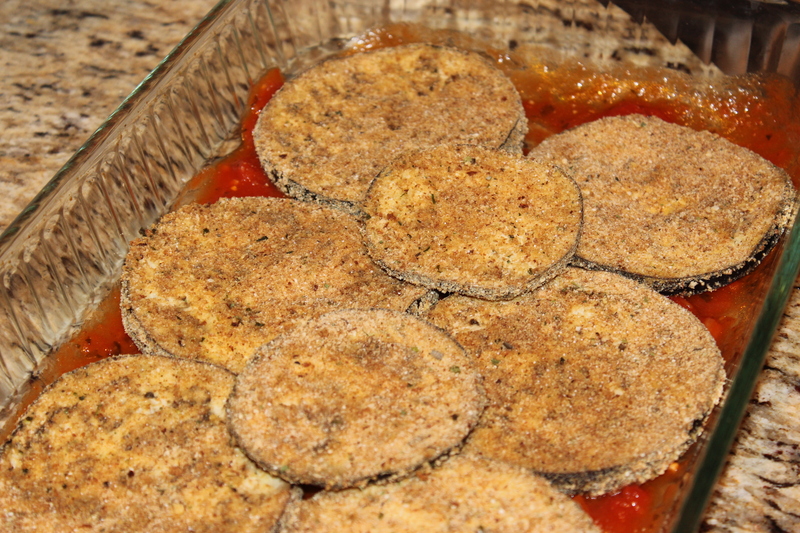 In 13×9 baking dish, line the bottom with some sauce and start layering the eggplant on the bottom. You want to fill the bottom as much as possible. You may have to cut a few in half. 6. Then top the layer off with some more sauce, and a mozzarella cheese layer. Then another eggplant layer and so on. 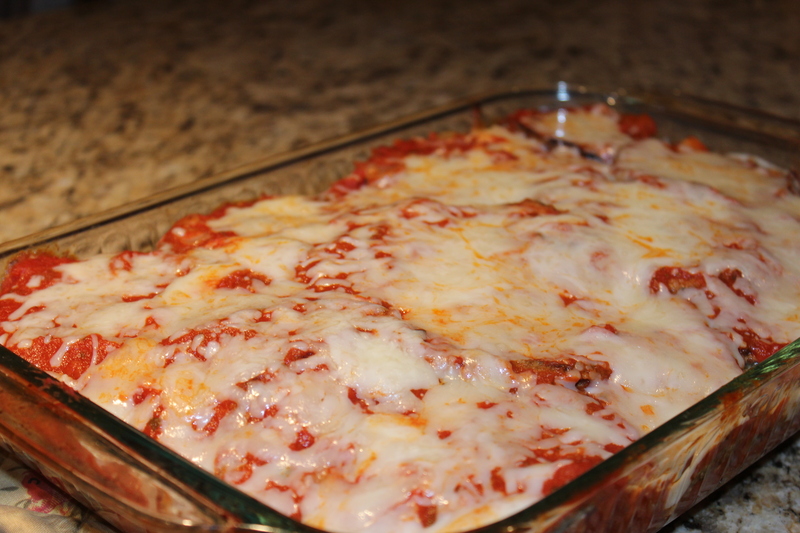 Until you have no more eggplant and the top layer is sauce and cheese. 7. Bake the dish at 350 degrees for 25 minutes, covered with tin foil. You need the dish to completely warm up and the flavors to blend. If you do not cover it, you will get a crunchy top. You can always take the tin foil off for the last 5 minutes if you want that effect. Not too complicated but just a little time consuming! 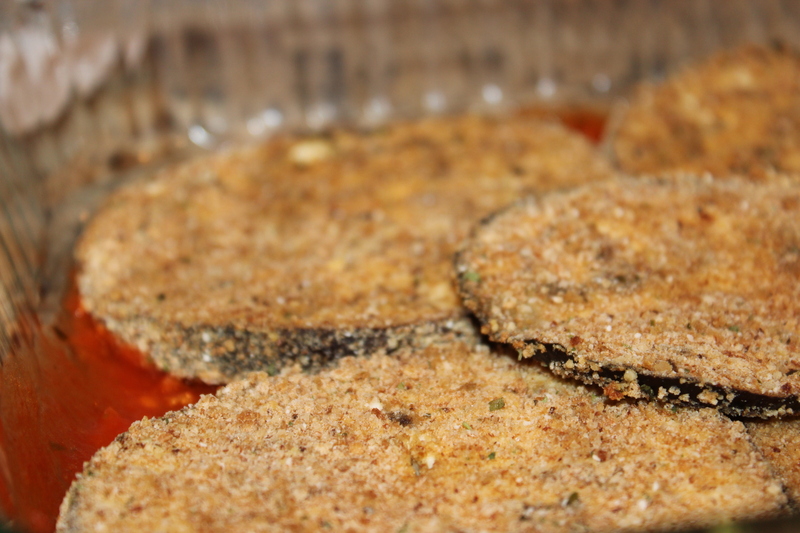 On the other side, you will have enough eggplant parm to hold you over for a while! 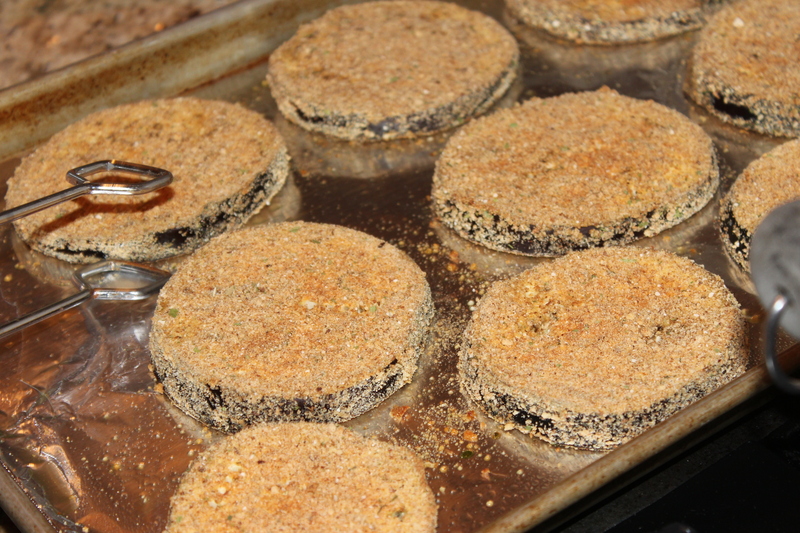 And if you have any left over baked eggplant, you can put it on sandwiches or on salads for other meals! What are some foods that you like now as an adult that you may have hated when you were a kid?? 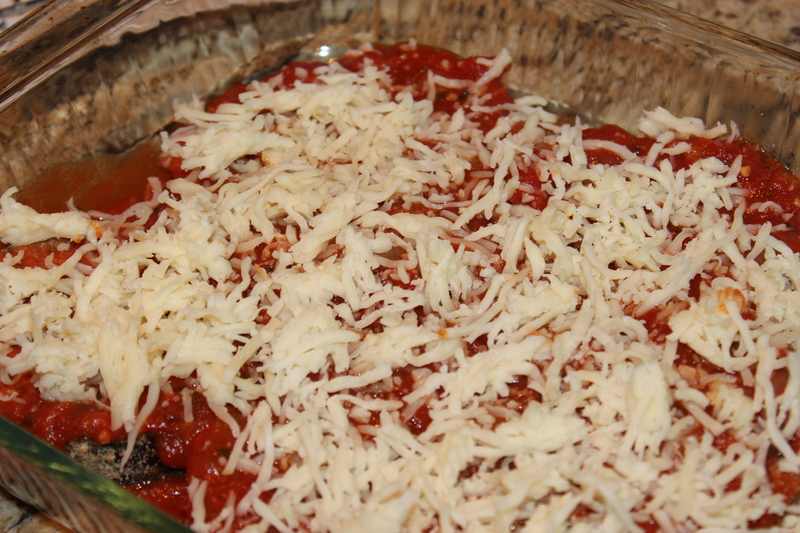 This entry was posted in Dinner, Vegetarian and tagged Baked, dinner, Easy, Eggplant, Healthy, Parm, Parmesan, Serves 7, vegetarian, vidalia onion on February 21, 2013 by Sizzle Food.